Global warming has become the stuff of history. While politicians and scientists hash out the details and jockey for authority, historians are beginning to integrate contemporary global warming into existing historical narratives. Granted, there have been climate changes in the past, and these have entered the historical record with names such as the Medieval Climate Anomaly and Little Ice Age. Such events continue to fascinate historians, scientists and politicians alike, because they seem to offer insight on the crucial question of what causes climate change. Yet our obsession with causes might divert attention from effects. Or better yet, it can blind us to the importance of environmental change itself as a cause for the unfolding of power relations in various parts of the world. In his recent book, In the Shadow of Melting Glaciers, Mark Carey identifies glacial retreat as a historical reality that has played a substantial role in the political, economic, and social dramas of South America. Carey’s book challenges us to think less like climate modelers and more like historians, anthropologists, and geographers. Understanding the true effects of climate change “requires knowledge of distinct societies,” he writes, along with their particular governments, institutions, scientific knowledge, religious values, and all the other trappings of life (p. 5). Doing so might seem like a daunting task, but Carey takes up the challenge with relish, and delivers an analysis of how disasters wrought by glacial retreat have refashioned both the natural and political landscapes of the Peruvian Andes in the twentieth century. The gallery of commentators assembled here is truly interdisciplinary. I asked anthropologist Julie Cruikshank to contribute because of her work on glaciers in an entirely different society, the Yukon Territory of Canada. She has spent years exploring the tensions between indigenous knowledge and Western science. 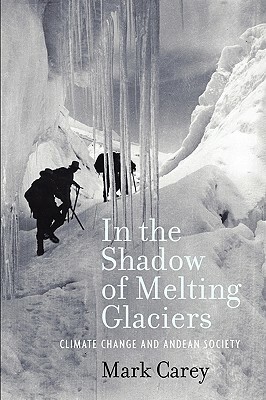 In her 2005 book Do Glaciers Listen? she outlined the conflicts of worldviews between indigenous peoples who attributed spiritual, sentient qualities to glaciers, and colonial Europeans who treated them as inanimate objects. Her work also has shown how divergent historical narratives have represented power struggles between indigenous people and Westerners. Shawn Van Ausdal is a geographer, and his work takes us closer to the scene of the action in Carey’s book. He is the only one of the commentators to be physically located in the region, though in the Colombian rather than Peruvian Andes. His writing explores the relationship between economic systems and the environment, and like Carey he confronts the competing political ideologies behind economic projects and business ventures. For example, he rejects as a stereotype the notion that cattle ranching in Colombia served mainly as a tool of territorial expansion. Instead, he has used corporate archives to demonstrate what he calls “the logic of livestock,” namely that it was indeed intended to turn a profit. Eve Buckley’s work has been at the intersection of environmental history, the history of science and technology, and the history of Brazil. Like Carey, she investigates the political motivations and implications of major public works projects, such as roads and dams. Her work has demonstrated how civil engineers in Brazil, true technological optimists, believed that such works would lessen social inequality in rural, impoverished areas, by giving them access to urban areas and services. And yet the influx of federal money actually had the opposite effect, by increasing elites’ control over land, water sources, and labor. This work highlights the political uses of science by “reigning powerbrokers,” revealing how contingent regional development schemes have been upon local politics and culture. As a final commentator, I asked geographer Gregory Knapp to contribute, given his longstanding interest in the region’s peoples and environmental conditions. Knapp has written numerous accounts of the Andes, covering vast stretches of time from prehistory to the present. This has included reconstructions of past farming practices and attempts to map indigenous territories using census data. He also has written at length on the “adaptive dynamics” of cultures in the Andes region, revealing how peoples (particularly in Ecuador) have changed their food production strategies over time. Methodologically, he has blended historical documents, ethnography, soil analysis, and mathematical modeling to produce convincing portraits of how societies have adapted not only to environmental conditions but also to changing views of territorial rights and labor practices. Michael E. Mann, Zhihua Zhang, Scott Rutherford, Raymond S. Bradley, Malcolm K. Hughes, Drew Shindell, Caspar Ammann, Greg Faluvegi, and Fenbiao Ni, “Global Signatures and Dynamical Origins of the Little Ice Age and Medieval Climate Anomaly,” Science 326:5957 (2009), 1256-1260. Julie Cruikshank, Do Glaciers Listen? Local Knowledge, Colonial Encounters and Social Imagination (Vancouver: UBC Press, 2005). See also Julie Cruikshank, “Images of Society in Klondike Gold Rush Narratives: Skookum Jim and the Discovery of Gold,” Ethnohistory 39:1 (1992), 20-41. Shawn Van Ausdal, “Pasture, Profit, and Power: An Environmental History of Cattle Ranching in Colombia, 1850-1950” Geoforum 40:5, 2009, 707-719. Eve E. Buckley, “Political Impediments to Technological Diffusion in Northeast Brazil, 1909-1964,” Comparative Technology Transfer and Society 7:2 (2009), 146-171. Gregory Knapp, Geografia Quichua de la Sierra del Ecuador (Quito: Ediciones Abya Yala, 1987). Gregory Knapp, Andean Ecology: Adaptive Dynamics in Ecuador (Boulder: Westview Press, 1991).